This page is about how to test Emission Labs® tubes the right way. There are many ways to test a tube, some are meaningful, and some can be misleading or just wrong. Add to this, the large variety of tube testers. Historic testers are mostly unserviced since 60 years, but some are professionally taken care of. New made testers can be good, but the majority suffer lack of understanding how tubes have to be tested correct. So we find yourself in a bazaar of different testers, old, new, analog, digital, full power, or impulse testers only, and hardware or software with or without errors. Users become confused with all of this. With this little overview we try to shed some light on this, but of course this can not replace profound knowledge. A perfect test result can only be made with professional hardware, a flawless database, and a user who understands about electronics. An approved database means, it compares to original manufacturer data, and test method as well. Each of these elements is a challenge by itself. Impulse testers, unable to heat up the anode, used for parametric testing. Self invented database, such as use average data and use that as 'must have' for a good tube. Test tubes with adjustable bias, which may not be tested or used like that. This is so for many tubes, and data sheets. Like for instance with 6922 (E88CC) RCA specifically write so in the data sheet. They do so for a good reason. Not reading the data sheets, or fill in missing information with phantasy. Our target is to offer tubes that are well matched, in a way which can be verified by others. At EML we have our own way of testing in the factory which is for ourself. Then for shipment, we match the tubes on the Amplitrex AT1000. We are not doing so, not because we think this is the best tester, but because it is the most widely used tester, and so users can verify the results. We had to choose for a method which most users can reproduce. This was DC heating, DC current testing only after thermal stability, and testing transconductance with a tone signal. These things the AT1000 can do. Use Auto bias testing when your tester can do so, otherwise, set tester by hand to specified current. Warm up the anode under those conditions for 3...5 minutes. Measure grid voltage needed, and Transconductance resulting from this. To judge remaining tube life, transconductance can only be compared to the value on the boxes. Deviation of +/- 5...10% is related to burn in and tolerance of the equipment. Above 70% (of 100) the tube should be working good in all amplifiers. From 60...70 % the tube will work in most amplifiers. Below 60% consider an exchange. Below 40% the tube should be exchanged always. Compare Gm to the tube initial Factory data, and not to the average data in the data sheet. The latter is no data as such, just an average of all tubes. This is an ever lasting subject. There are a few methods, which differ by precision of the result. We begin with the best method. Transconductance is a dynamic parameter, so to say an AC signal parameter. For best accuracy, it is s measured by applying a distortion free sine wave signal to the tube, with an oscillator, and then monitor the output signal of the tube, while using a band pass filter. Testers like the Russian L1 or L3 testers are doing this, and some other high class vintage testers. The reason why this is the best method, is any distortion elements from the output signal gets filtered out, as these come in the form of higher harmonics. Also any hum and noise is filtered out. So hum, noise and distortion make the output signal artificially too large, any make the output signal (and so Gm) look larger than it is. An oscillator method which uses no filtering, is better than non at all, but it is not ideal. A lower class method is just use a DC change on the Grid 1, but this doesn't filter out any of the above mentioned signals, and some testers suffer a drop of the plate voltage in such a case too. So in case of any difference with the first method, it is clear where it comes from. By software, it is possible to derive Gm by calculating it via the Barkhausen formula, but that may have resemblance with method 3. However when with clever algorithms it may be possible to make it look more like method 1. Keep in mind, Gm depends heavily on the plate current, as you can impressively see from the curve on the left. This is from the 1602 which is nothing but a better 10Y by RCA. As you can see here, Gm varies from 520 to 2100 depending on the plate current. So a huge difference of 1:4 So it should be clear when somebody says he 'has measured Gm of 1600', this by itself has nothing to say. Also results from tube testers, saying 'this is the Gm' but not saying the working point are meaningless too. If this Gm of 1600 was measured at a plate current of 60mA, the tube is bad, and when measured at 10mA, a Gm of 1600 is very high. . From this it becomes evident that saying 'this tube has Gm of 1600' is a useless information, as long as we do not know the plate current. The Gm value can only be compared with the data sheet at the SAME operating point where the data sheet specifies it. So as long as you aware of these potential error sources, it is ok. It would be totally wrong however to measure Gm at any random current, like done with fixed grid voltage testing, and then compare this with the data sheet value for a bogey tube. Why fixed grid voltage biasing is useless for tube testing. Here is a numeric example. The tube in this example is the RCA 10Y (1602 special). The data sheet specifies Gm of 1330 at 10mA, which should happen with an average tube at a grid voltage of -23.5V and 10mA plate current. Of course no two tubes will have average values. In order to compare Gm of an unknown tube with the data sheet value of 1330, you need to set this tube for 10mA, by adapting the grid voltage to whatever value is needed. It would be wrong, to set the grid voltage to simply -23,5V because there is no 'must be' for this value. 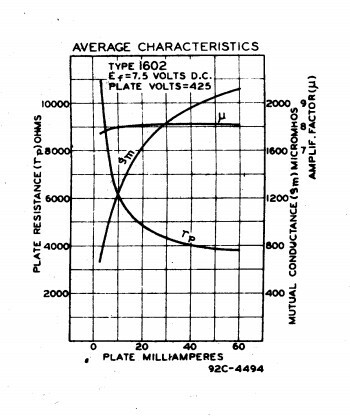 In fact, plate current is so variable, that minimum and maximum values are not even NOT specified that way. So it becomes totally silly to measure plate current still, and compare it with the average value of a bogey tube. Any 100% strong, factory new tube, at -23.5V will draw anything from 7 to 14mA. So it would be wrong, to let the tube draw whatever current from 7...14mA, measure Gm at that plate current (whatever it is), and compare this with Gm plate current at 10mA. Seeing this from anther perspective, you can test a tube at any place on the Gm curve you like, but not compare such a measurement with another one, which is NOT on this curve. Logically, the only way to synchronize this, is by testing any 10Y at 10mA, and compare this with the curve at the left at 10mA. Or, alternatively do the whole process at 20mA or any other current you like. Having understood the above, it should be clear, a Gm measurement should be made always at the data sheet specified DC current, and never at a specified grid voltage. This is written here is some detail, because we use the AT1000 at the factory for the data on the tube boxes. We do not do so, because it is such a good tester. The reason is, it is commonly used, and indeed it is one of the very few testers that can test under full anode power. AT1000 from before a certain date, have errors in the internal data tables for all directly heated tubes. Please communicate with Amplitrex directly, how to repair this. (We are not a service address for them) However when you set the tester to AUTO BIAS, which is required to repeat the factory test, this problem plays no role anyway. However you will soon see, sometimes (not always) tubes that test 'strong' on Auto Bias, may test 'weak' on Fixed Bias, or vice versa, so you can already see one of the methods is not right. Use only: AUTO BIAS. AT1000 Stand alone mode or computer controlled mode. Make good note, the stand alone mode has generally lower precision, because the tubes warm up only the heater, and not the anode, before a measurement. It is a pity this tester is factory delivered in Fixed Bias mode. Users have often no idea this test method is generally invalid for 99% of all tubes ever made, including all EML. Stored in the tester is a tube data table. If the tube is missing, you have to add it first, which is not difficult. Refer to the manual, so you know how to do this. Verify if the tester uses indeed the same Anode Voltage and Anode current as we have on the tube boxes. Other settings are possible, for Research purposes, but can not be used to verify factory data or condition of the tubes. At the end of an AUTO BIAS test, the result will be: The Grid voltage (-Ug) and transconductance (Gm). If the tube is new, this complies with the factory test data on the box. For higher precision, the computer controlled mode should must be used, which allows heating up of the entire tube until thermal stability occurs, which is the only really good way to test a tube. For new tubes, the difference between stand alone more and computer controlled mode will be small. Used tubes however, benefit more from thermal stability. So, a quick test in the stand alone mode, will make used tubes look less good as they are. If a tube is missing, add it with the tube editor program. Alternatively use 'set up' files This allows changes easier. So you can use a standard 300B setting, but save individual plate voltage or current as a so called 'set Up' file on your PC. This would apply for instance nicely to a 300B-XLS. However at printing is prints then '300B' is tube number. To prevent this, add 300B-XLS to the data base with the tube editor program. Always choose 'Auto Bias' before testing. Begin by choose only 'Noise Test'. This heats up the tube. Make sure, no multiple tests are selected. Start the noise test, and observe the anode current in the AT1000 display ALL OF THE TIME. This will make the tube very hot. Stop the test when Anode current rises more than 10% above the expected value. If the test had to be stopped, restart the test right after. This will set anode current to 100% again. Each time re-start the test when Anode current rises more than 10% above the expected value. After 3...5 times the tube becomes stabile, which can take 5...10 minutes. You can use a head phone during that time, and check noise. After a total of 5 minutes the tube is thermally stabile. f done, exit stop the noise test, and do the 'Tube test' immediately after. Now -Ug and Gm is tested under the specified anode current, and results should correspond nicely to the tube box. Devices like 'utrace' and 'e-tracer' works amazingly nice, but they have a disadvantage: They test the tube in pulse mode, and have no way to warm the tube up properly. If you have an analog tester, so one that can set a voltage and current for as long as you want, you will see test data of a tube changes +5...+15% after letting the tube run long enough. (which means no change any more over 5 minutes). A tube should only be tested fully warm, including the socket. Anode distance is a function of the temperature, caused by thermal expansion of the metal. Moreover, anode heat radiates also back inside the tube, causing mechanical shape changes of the grids, and additional heat up of the cathode. Particularly older tubes will benefit from this. Moreover grid emission gets only visible when the tube is running close to maximum dissipation. So small grid leakage measured this way, means probably you have massive grid leakage in reality Whereas any medium grid leakage in reality, will probably result in 'no grid leakage at all' , if tested in pulse mode only. Though we have to say here, Emissionlabs tubes are not expected to develop grid emission anyway. So all in all e-tracer and utrace seem useful testers here. This should repeat EML test data precisely. We have tested this with the Russian L3-3 and it works nicely. This should repeat EML test data precisely, as long a you correct the grid voltage for half the heater voltage. We have tested this with the Metrix U61 and it works nicely. Unfortunately it limits at 250V DC. (and a little bit outside if you try with an external voltmeter) Yet it can do not many large tubes. This tester has a possibility to heat the tube under full power. After this, a 10 curves chart is made in just a few seconds. This should repeat EML test data precisely, as long a you correct the grid voltage for half the heater voltage. It can deliver unusual high RMS power to a tube. Unfortunately such a tester is not made any more. This is the top class of the vintage testers. Measurements have reference quality. Unfortunately it is limited to +300V, but when using an external voltmeter, and not too full DC current, it can be used above 400Volt, provided you have the right test cards for this. We have test cards for EML 5Z3, 5U4G, 80, 81, 274A, 274B, AZ4, 2A3, 2A3-Mesh, PX4-mesh, AD1, 300B, 300B-Mesh, 20A, 20B and 20B-V4. This is the Roll Royce of the new made tube testers. You do have to set the tester for DC heated test results, in order to find the same results as we do. Burn in table for 10 tubes. (five running). Note the light bulbs which act as load and fuse at the same time.